Webster University's choir during a 2015 performance. 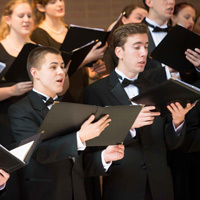 ST. LOUIS - The Webster University Concert Choir will premiere a new choral work during the Leigh Gerdine College of Fine Arts Music Department year-end concert May 1. “Angels in a Time of Terror,” written by Associate Professor Kim Portnoy, will be performed by the Choir and two harpists under the direction of Professor Trent Patterson. The concert starts at 7 p.m. May 1 at Grace United Methodist Church. "We are always pleased to feature the talents of a faculty composer in collaboration with one of our ensembles,” said Jeffrey R. Carter, professor and chair of the Department of Music. “Kim Portnoy has led our music composition program for many years, and writes music that is accessible, beautiful, and meaningful. Trent and the Concert Choir have delighted in putting all of this together, along with our harp professor and one of her students." The Webster University Concert Choir will be joined by the Women's Chorus. They will be performing the “Magnificat” in A Minor by Nicola Porpora (edited by Joan Whittmore), “Spring Shall Bloom” by Susan LaBarr, and “Total Praise” by Richard Smallwood (arranged by Doreen Rao). Grace United Methodist Church is located at 6199 Waterman Blvd, just south of the Delmar Loop on the north side of Forest Park. Admission is $5 per person and tickets will be sold at the door.